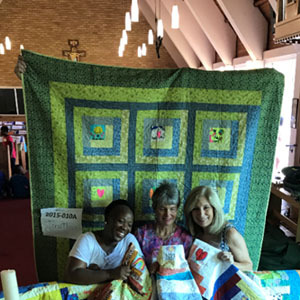 Caption: L-R: Lwazi Mofokeng from DIRCO, Gretchen Ginnerty, President of the Love Quilt Project (LQP) and Diana Higgs, SA coordinator of the LQP. JOHANNESBURG. 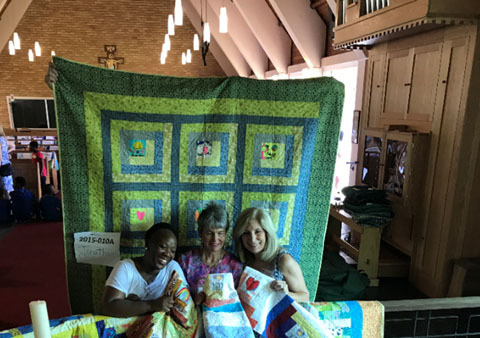 20 November 2018 – South African Airways (SAA) freight division, SAA Cargo, is the proud airfreight partner of The Love Quilt Project (LQP), the US-based non-profit organisation that helps vulnerable children in South Africa and the US. SAA Cargo, as part of the airline being a responsible corporate citizen, when contacted once again by LQP through its New York office, jumped at the opportunity to extend a helping hand to those less fortunate. To assist, Cargo recently transported over 100 handmade quilts from the US on behalf of LQP. Many of these quilts were handed over in Pretoria to children who are orphaned and many of them affected by the HIV/Aids pandemic on Saturday, 17 November 2018. More quilts will be given to children in the Western Cape on Saturday, 24 November. SAA Cargo, in partnership with LQP, has transported over 400 quilts over the past five years for the benefit of the children. Gretchen Ginnerty, the LQP President says, “LQP uses the healing power of love to change the lives of vulnerable and orphaned South African children, many of them affected by HIV and AIDS. American children send messages of love expressed through art to brighten lives and help heal these children. These messages are created on fabric squares stitched into beautiful quilts that are given to children in need. LQP teaches tolerance and compassion, and through this initiative, the children are taught about the healing power of love and its ability to positively impact the world”. This project is in line with our belief that, “Love is the common thread that binds us all together as humans.” In a spirit of reciprocity, the South African children receive this same lesson before they receive their quilt and also create art squares for quilts to be given to American children mostly affected by HIV/AIDS.